The Retinal Map was created as a teaching aide for junior doctors at the Oxford Eye Hospital. The map is constructed to imitate what an ophthalmologist would see when they view the eye. In this case the right eye (OD) with the optic disc represented by a circle on the right and the fovea positioned centrally. 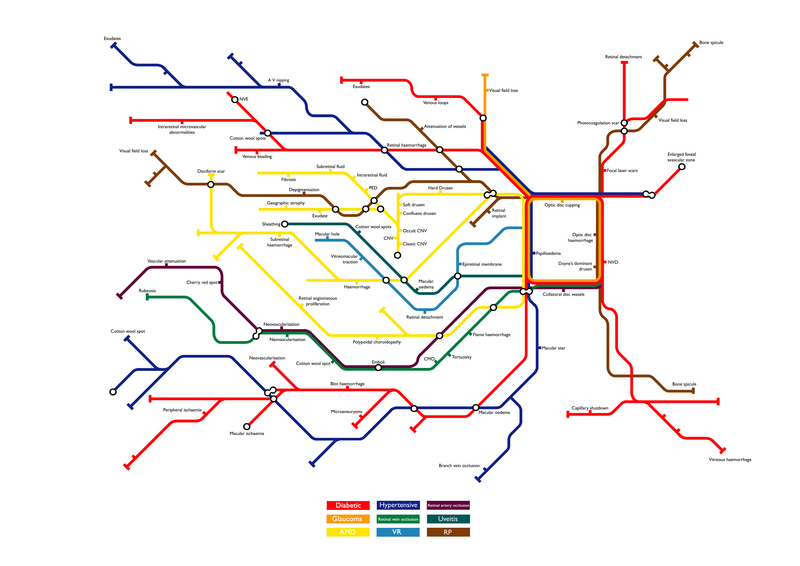 It was my intention to use the visual language of the London Underground Map replacing ophthalmic disorders for the lines and pathology for the stations to create an original way to present this information. This artwork was select to be installed at the Oxford Eye Hospital and dedicated to Dr Jo Steen. Topcon have recently brought the rights for this artwork and use it for promotional and teaching purposes.